The Red String of Fate - Do you believe in Destiny? The Red String of Fate – Today I was thinking of love, carnal love, the beautiful love, the love linked to a “love”, the one that runs through our body and makes us feel butterflies in the stomach. I was thinking about the wonder of how human beings are predetermined to meet, especially when we establish links of eternal love with someone we get to love so much even before ever meeting. The Red String of Fate. Speaking of fate, there is a Japanese and Chinese legend associated with the mystery of how human beings find that other half who comes to fill our life with that “something” that was missing. It’s, they say, an invisible red thread that is tied to the small finger and connects those who are destined to meet regardless of time, place or circumstances. The thread can be stretched, shrunk, lost or tangled, but it will never break. A red thread that goes directly to the heart and connects loves that are eternal, those that are deep, those that symbolize the before and for which there is no after. The Red String of Fate. According to this Chinese legend, this wonderful red thread exists but cannot be seen with our eyes, however it joins two different and separate persons by the fingers; people who don’t know each other and who never have seen each other. But, who does this thread connects them to? The Chinese believe that each person is connected with the other person that they are destined to be with, and that this thread that joins them is what unites them no matter where they are. Since that red thread in addition to being invisible to the human eye, is strong, capable to withstand any distance, turn, knot or whatever comes, it’s a link that no obstacle will be able to snap and it will keep those two persons joined forever. The Red String of Fate never disappears and it stays permanently tied in spite of time and distance. It doesn’t matter how long it takes to meet that person, nor is it important how much time passes without seeing each other, it doesn’t even matter if you live at the other end of the world: that thread will stretch to infinity but will never break. “Once upon a time, an emperor heard that a very powerful witch lived in a province of his kingdom and that she had the power see the red thread of destiny and he sent for her. When the witch arrived, the emperor ordered her to look for the other end of the thread that he had tied to his little finger and to take him to the one who would be his wife. The witch agreed to this request and started tracking and following the thread. This search took them to a market where a poor country woman with a baby in her arms was selling her wares. When they arrived where this country woman was, the witch stopped in front of her and invited her to stand up. She had the young emperor come nearer and said to him: “Your thread ends here”. Upon hearing this, the emperor became furious thinking that the witch was mocking him, he pushed the country woman who was still carrying his little baby girl in her arms, making her fall and causing a large wound on the baby’s forehead. He then commanded that the witch be imprisoned and beheaded. Many years later the moment came for this emperor to marry and his court advisers recommended that he marry the daughter of a very powerful general. He accepted the suggestion and by and by the wedding day arrived. He laid eyes for the first time upon the face of his bride as she entered the temple in a beautiful dress with a veil that covered her all over…then when the veil was lifted, he saw that her beautiful face had a very peculiar scar on her forehead. You have this thread since your birth and it will accompany you more or less tensed, more or less tangled, throughout your entire life. It activates a love, closes the past and connects your energetic aura to find the love that you need in your life. Remember, it’s not any person, it’s The One that has the other end of your red thread of destiny. As an energetic designer, I have lent love a hand with several designs to revive love or to brighten the aura with the power of the minerals, to find love. But not just any love. The one you need, the one destiny gave you and has not yet arrived in your life. 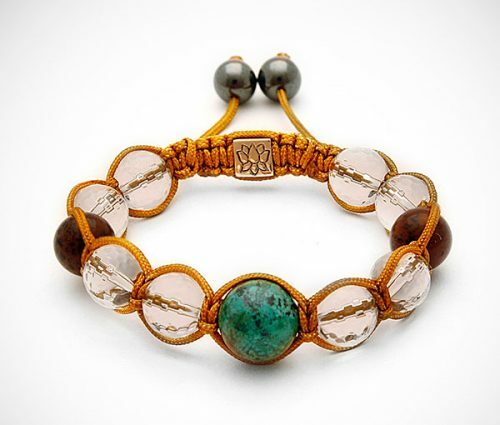 Find your love or revive the one you have with our bracelet The Energy of Love.